Posted on October 22, 2013 by Becka O. 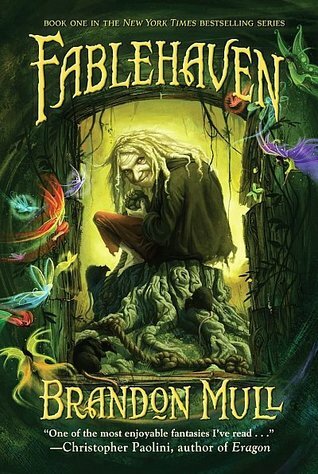 In a wonder of a series, Brandon Mull wrote a 5 book masterpiece called Fablehaven. The books are in the same league as Percy Jackson or The Emerald Atlas. With funny, personable characters, this book will appeal to both girls and boys. Kendra and Seth go relunctantly to their grandpa’s estate in New England while their parents go on a cruise. Although they originally find it boring, Kendra soon discovers a curious journal titled, “Journal of Secrets.” In the journal is one cryptic line: Drink the Milk. Once they find out what this means, their eyes are opened to the world of Fablehaven- a world of creatures from all branches of mythology and Brandon Mull’s imagination combined. Seth, ever the troublemaker gets into some trouble with a witch and some fairies. He also is the reason for his grandpa’s abduction. I won’t say anything about the rest of the book except this: it is amazing! in the third book, Kendra and Seth are having trouble convincing their parents to let them stay at fablehaven. School is about to start and they have been gone all summer. But something terrible is going on. A shadow plague is beguiling the creatures of Fablehaven, but Seth may be the person to help stop it. Meanwhile, Kendra is traveling to the Painted Mesa reserve in Arizona to try to retrieve another artifact, only to find out they have sacrificed a mission in vain. The ending of this book is too wonderful to spoil. In the beginning of this book, Kendra is kidnapped by the society. Later, Kendra and stowaway Seth go to the dragon sanctuary to retrieve another artifact. To retrieve it they must also “borrow” the first horn of a unicorn. Their many adventures in the dragon sanctuary culminate in a great victory and a great betrayal- much worse than book 2. The cliffhanger ending on this one is also killer. With the opening of Zzyzx imminent, all of them end up in the dungeon of the secret fifth preserve which is where the last artifact and their greatest enemy lies. The artifacts are all collected and there is just one obstacle to the opening of Zzyzx- the eternals. 5 immortal humans who must be destroyed and Kendra and Bracken (a super awesome unicorn… Yes, UNICORN) are determined to defend them. Eventually they end up on the island of Zzyzx and… You’ll have to read them to find out! This entry was posted in Book Reviews and tagged adventure, brandon mull, fantasy by Becka O.. Bookmark the permalink. Nice summary! This is an amazing series!